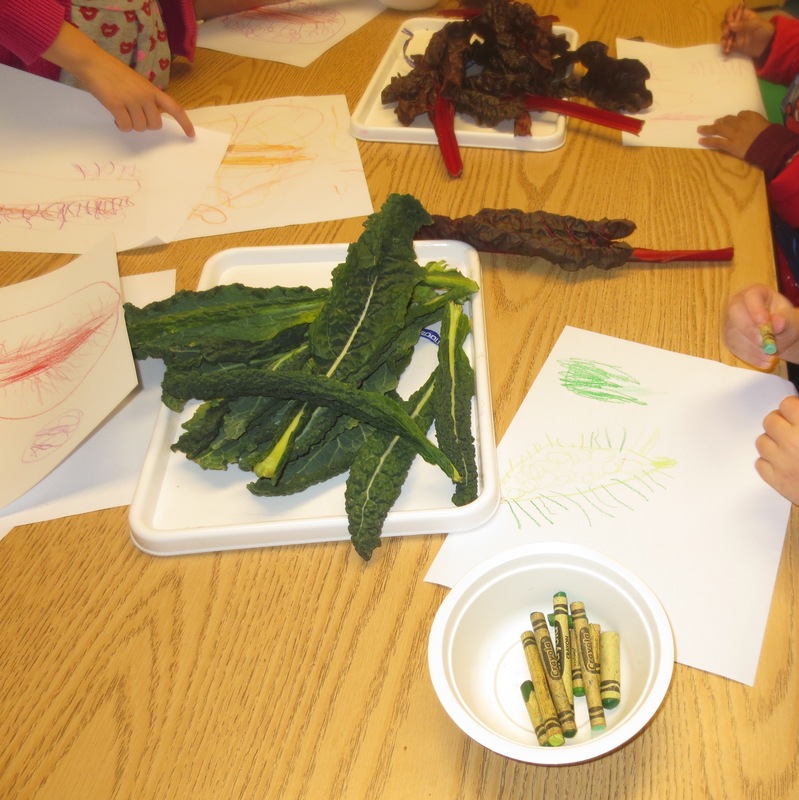 As a preschool teacher for many years, I am always asked what kind of preschool program I recommend. The program in itself should not be the deciding factor. You have the child’s interests to consider, as well as the ability of the teachers to implement the program. I was fortunate to participate in an intensive preschool teaching conference by Bing Institute, the preschool laboratory program of Stanford University in California. 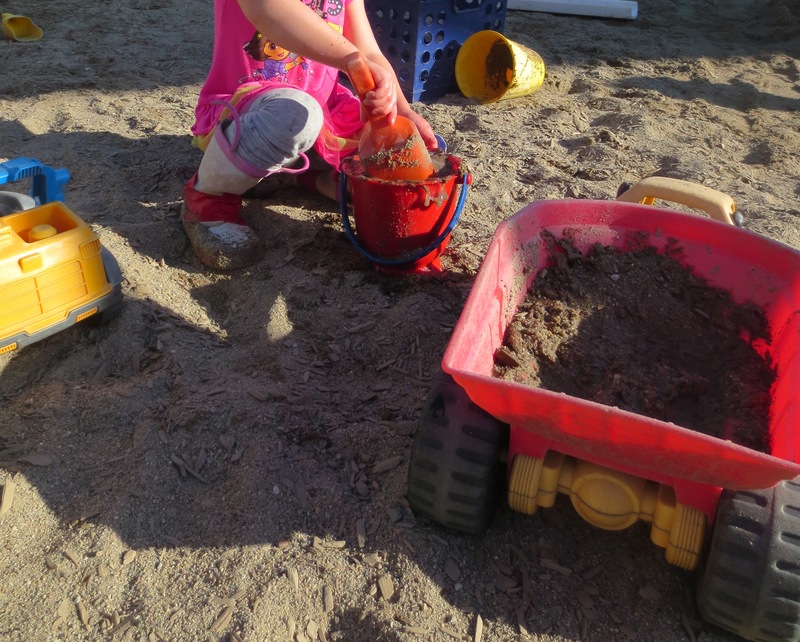 For five days they showed through classroom observations and experiential activities, how the five basic simple materials– sand, clay, water, blocks, and paint when used consistently, could teach and engage young children. It was impressive how the organizers were able to tie up the use of the basic materials to the cognitive, social, emotional, and physical domains of learning. On the last day of the conference, as the facilitators were trying to summarize 40 hours of hands on experience and presentations, the participants were asked to share what they learned. As I was contemplating my answer to share with my peers, I had an epiphany! The materials are not as important as the teachers who use them. The children become successful in making connections to the real world because of the teachers. The teacher’s skill to facilitate learning and growth in the classroom is crucial. Smart boards and computers are important and some say, even necessary, to stay competitive in the preschool market. But I say, a good teacher with simple materials will always trump incompetent teachers with computers. Posted in Tina's Classroom and tagged Bing Institute, homeschool, life skill, parenting, preschool education, teaching. Bookmark the permalink. 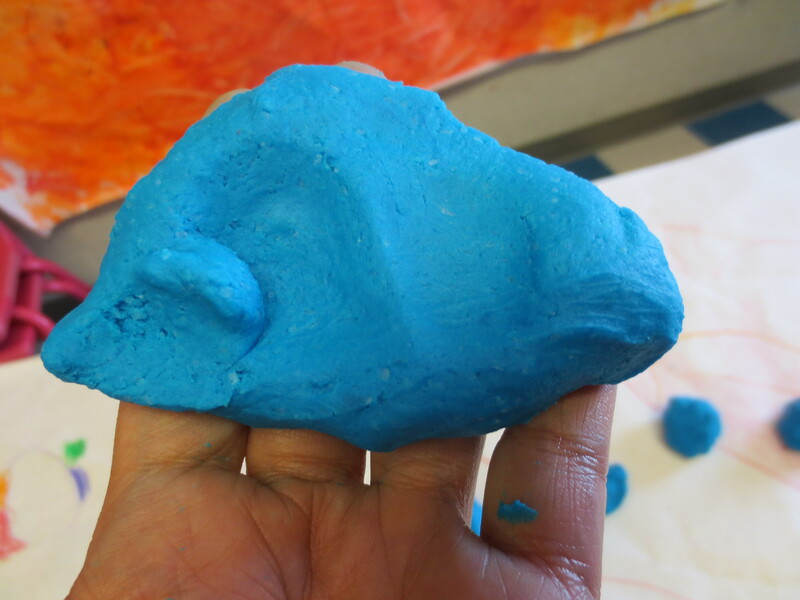 There is something relaxing and satisfying with kneading a ball of clay. You can pound, squish, roll, poke holes, and pinch it–and when you are done disfiguring it, you can flatten it again and make something beautiful with it. It is a forgiving material. 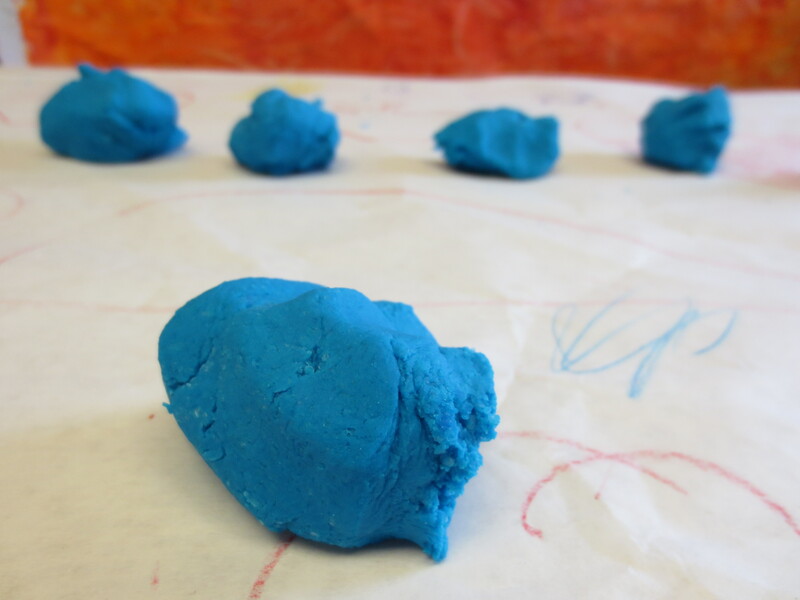 Clay (or in this case, dough) interests kids because it is a non-threatening material that does not require special tools to appreciate. A child can knead and manipulate it for as long as he likes. It can take whatever form and shape he likes. 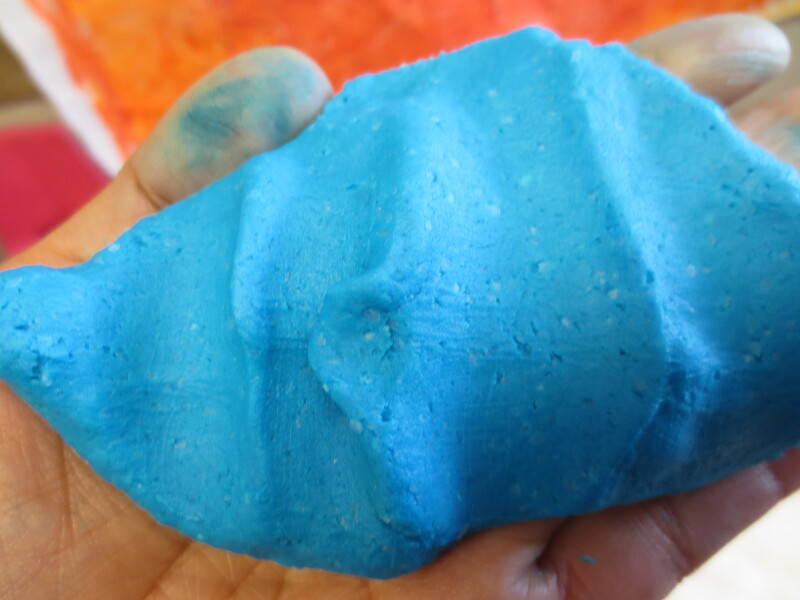 Playing with clay is known to improve hand-eye coordination, and strengthen hand and finger muscles–all important building blocks for writing. Keep in mind though that for a child to be successful, the focus should be on the process, and not the finished product. Here is the recipe that I use. I like it because it cooks in the microwave. Put all ingredients in a microwavable bowl. Mix. Cook on high in a microwave for 1:30 minutes. Stir. Keep on cooking for 30 seconds until you like the consistency–no more than 4 minutes. If too sticky, sprinkle additional flour. The oil makes the mixture smooth and malleable. Do not overcook the dough. Before putting in the microwave. 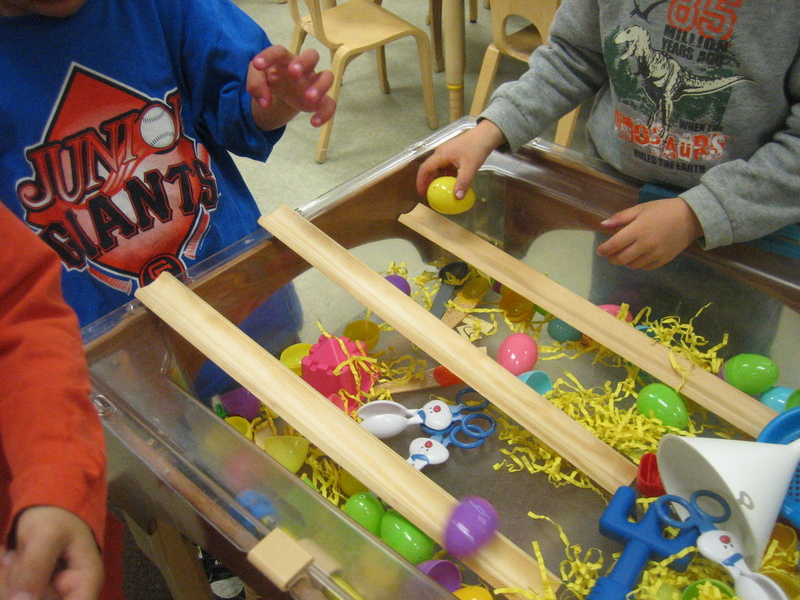 I break the whole ball into several small pieces for the children to use. You want the dough to be soft and pliable. I use it straight from the microwave when it is still nice and warm. The color does not stick on the fingers. 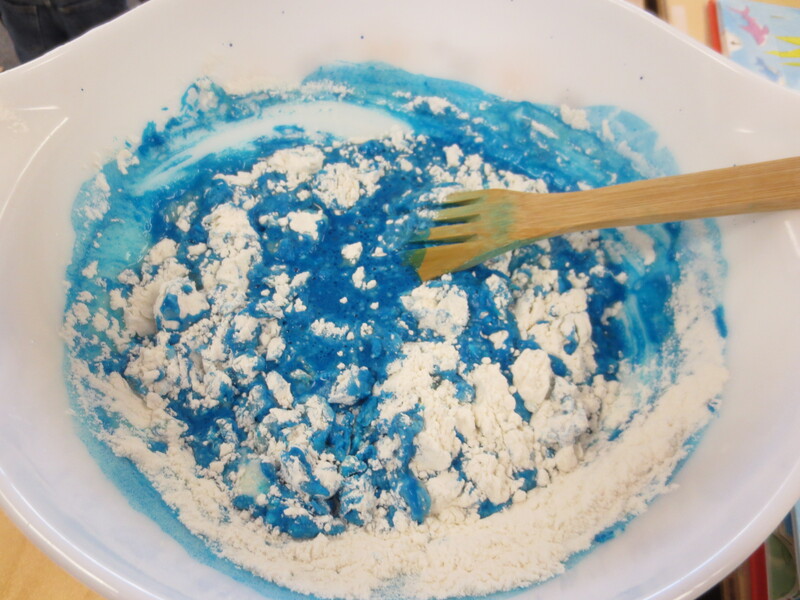 My fingers turned blue because I spilled the food color directly on my skin while I was pouring it in the dough mixture. Posted in Tina's Classroom and tagged child development, homeschool, parenting, play dough recipe, pre-school, teaching, toddlers. Bookmark the permalink.